Team MenoPal (from left) Bo Guan, Chaya Edelman, Mican Meneses and Cira Cardaci with fellow CCNY alum and Nestle SHIELD senior medical director and head of medical innovation Dr. Warren Winkelman. 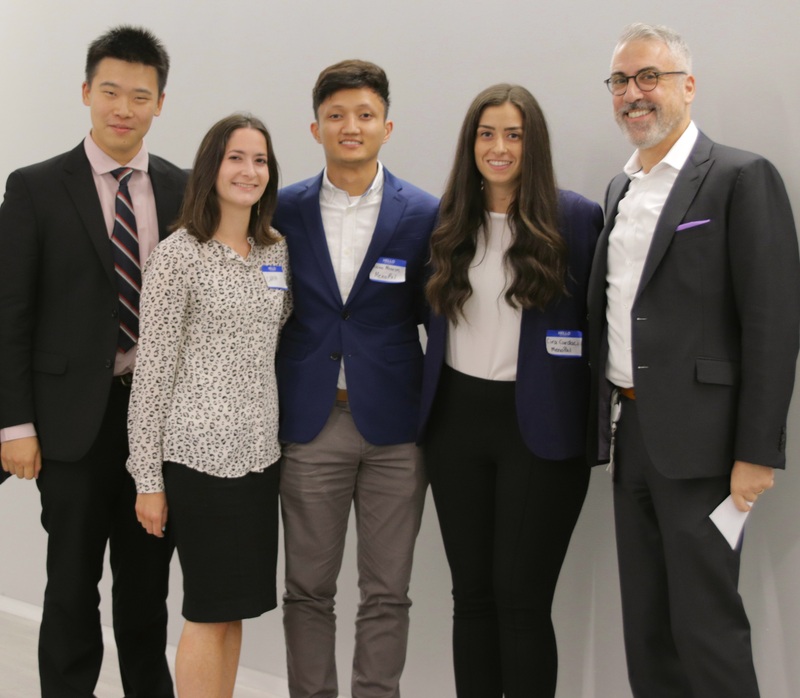 Earlier this month, an MTM alumni Biodesign team won the Nestlé Skin Health SHIELD “Journey to Innovation in Skin Health” Pitch Event. MenoPal, a team comprised of 2017-2018 MTM graduates, is working on a "Wearable Medical Device for Menopause Management." The team will receive $25,000 in project funding and, importantly, the opportunity to work with SHIELD on further development of their product. MenoPal was also recently awarded a National Science Foundation I-Corps™ grant to conduct customer discovery around their product. “We are excited and inspired to see talented biotech engineers and developers offering a solution for the shockingly underaddressed needs of menopausal women,” said Dr. Warren Winkelman, Senior Medical Director and Head of Medical Innovation for SHIELD. “MenoPal empowers women in a data-driven and quantified way to take control over what can be a distressing transition and minimize their discomfort, uncertainty, and stress. Further, we see this collaboration as an important opportunity to elevate a new narrative in the face of continuing stigma associated with aging and menopause.” Dr. Winkelman is also a proud City College alumnus who has sponsored MTM teams and worked to integrate the mission and growth of the program. Few scientific degree-granting programs have attempted to integrate business practices with the skills that are necessary to design effective clinical solutions. City College’s MTM program explores and examines all facets of the medical technology development process from creating a functional prototype to the build-out of business and clinical strategies. The program prepares graduates for careers in industry, start-ups, medicine, and clinical research. MTM’s 3-semester Biodesign course sequence and project teach students a hands-on approach to developing a new medical technology that addresses an unmet clinical need. Students have the opportunity to interact with outstanding faculty, thought leaders and cutting edge experts in the medical technology industry who provide up-to-date advice and training in the quickly developing field of translational medicine. This approach is engaging for engineers, scientists, researchers and others with a STEM background. By completing a stimulating curriculum and challenging program that fosters leadership, entrepreneurship, and innovation, MTM graduates are ready to create and develop the medical technologies that will change the future of healthcare. Applications are currently being accepted for the 2019-2020 academic year and interested individuals can learn more about the program here.